The new Nissan Qashqai was unveiled to the world in London last week with Nissan boasting that it signals the start of the second generation of crossovers. Interestingly the design partly reflects the input from a small, yet significant, sample of existing Qashqai drivers from across the world. Nissan says more than 2,50 people submitted images which came together to form the shape of the new Qashqai. Nissan’s Qashqai is long established as the leader in the crossover market, with more than two million produced since 2007. It appeals to both C-segment drivers looking for additional style, technology and excitement, as well as downsizing buyers seeking greater efficiency. 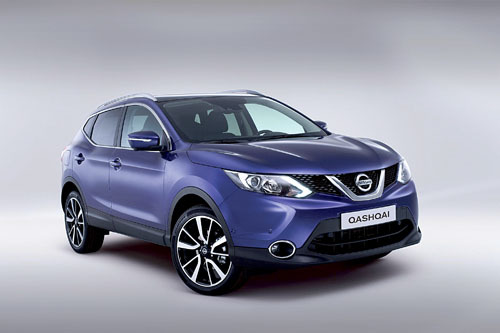 Nissan believes the new Qashqai is set to enhance Nissan’s crossover leadership position when it goes on sale in selected global markets from January 2014. Nissan says that premium technology, second generation crossover design, and enhanced dynamics all combine to form the backbone of the new Qashqai. The striking new Qashqai is slightly longer (49mm ) than the current model and fractionally lower and wider, giving it a sleek, poised stance while maintaining the crossover style, compact dimensions and raised driving position. Distinctive features – including a clamshell-style bonnet - lend a premium appearance while retaining the Qashqai’s strong visual DNA. Nissan says in common with all its new cars, the Qashqai is packed full of innovative technology. It offers drivers a comprehensive suite of advanced technology features enhancing every aspect of driving. Nissan’s Safety Shield technologies now incorporate: Front collision avoidance, driver attention support and traffic sign recognition, along with several other vital driver aids, while intelligent park assist takes the stress out of urban manoeuvres. The new Qashqai is designed to make premium technology more accessible than ever. The innovation continues with the new Qashqai’s powertrain range, which is wider and more efficient. Every engine uses a turbocharger to reduce capacity, emissions and fuel consumption while maintaining excellent performance with class-leading CO2 emissions – from 99g/km. Efficiency is further enhanced by an extensive mass reduction programme, resulting in 40kg weight loss on some models despite the extensive addition of new equipment. While front-wheel-drive variants will account for the majority of sales in most markets, four-wheeldrive versions will also be available to match a choice of six-speed manual or new Xtronic transmissions. Inside, a dramatic rise in material and design quality adds significant interior appeal to the Qashqai package. Versatility also remains a core crossover attribute. And Nissan’s engineers have devised innovative ways to make the new Qashqai fit into drivers’ lives. Delivering greater occupant space and a larger luggage capacity enhanced by a variable floor system, the new Qashqai offers space to store the parcel shelf when not in use. The new Qashqai is based on the new common module family Renault-Nissan alliance platform, which it says brings outstanding engineering efficiencies to the consumer. Designed and engineered in Europe, for Europe, the new Qashqai looks like the best just got better. And it goes on sale here for the big January sales.